GULF OF ADEN (April 17, 2011) Commander Task Force (CTF) 465 European Union Naval Forces, Commodore Alberto Correia, visits CTF 151 flagship, USS Mason (DDG 87). 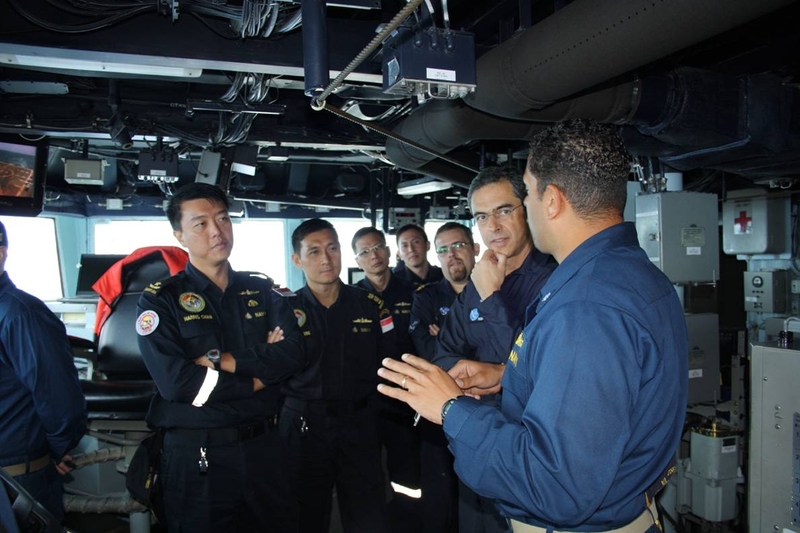 Commander CTF 151, Rear Admiral Chan, noted that such exchanges at sea are vital in extending the network for information sharing and operational cooperation amongst coalition forces participating in counter-piracy operations in the area. On the bridge of USS Mason from left to right: Radm Harris Chan; SLTC Thng Chee Meng; LTC Cheong Kit Chong; Maj Dewayne Wan; LtCdr Artur Lucas da Silva; Cdre Alberto Correia; Cdr Adan Cruz.